Four out of five New Jersey farmers do not have written estate plans. Who will get your farm when it is time? A written will is not enough. This workshop will help you ensure that your wishes are honored when the time comes. Registration is available online or via phone at 609-989-6830. 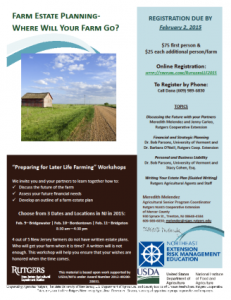 $75.00 for the first farm/family participant and $25 each additional farm/family participant. For details please click to view the flyer.